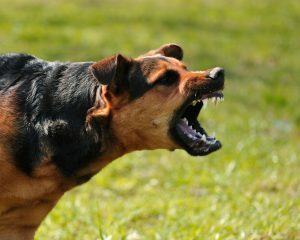 Aggression is the most common and most serious behavior problem in dogs. It’s also the #1 reason why pup parents often seek professional help from behaviorists, dog trainers, and veterinarians. The term “aggression” refers to a wide variety of behaviors that occur for a multitude of reasons in various circumstances. Virtually all wild animals are aggressive when guarding their territories, defending their offspring, or protecting themselves. The majority of the time, when you see an aggressive dog, it wasn’t born that way. Owners of dogs just may not fully understand how to train their dog. This lack of training often leads to aggressive behavior in dogs because they are responding to situations using their primary instincts, rather than using proper training since they have never been taught how to respond. Dogs displaying aggression may be reacting in fear or possessiveness. An owner who fails to see the signs of aggression as they develop will soon find themselves with a dog completely out of control. This is the owner’s responsibility, and does not mean the dog is a “bad dog.” It just means it is time for aggressive dog training to help you make your pup the loving friend that your family needs them to be. Most dogs and puppies engage in mouthing, nipping or play biting, which is completely normal. If this is the case, your playful dog will have a relaxed body that isn’t tense or aggressive. When he nips or bites, the puppy or dog won’t show teeth or bite down hard. 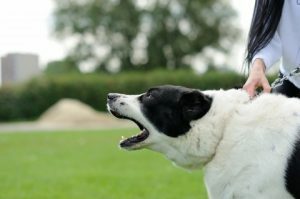 However, if your dog is aggressively biting, his body will be stiff, he’ll show his teeth, and he’ll bite quickly and hard. In many cases, dog aggression can be prevented with positive reinforcement dog training while your pup is growing up. However, if you have an adolescent or adult dog showing signs of aggression, we recommend you consult with a professional dog trainer immediately. Our team at Come & Train It K9 helps folks in the greater Houston area with aggressive dog training. We’d love the opportunity to earn your business! Give us a call today to learn more about our training options for your pup. You’ll be glad you did!